The College Football Game of the Year concept was developed by Daniel Moore, the 2005 Sport Artist of the Year. The winning school receives a commemorative limited edition fine art print and a $5,000 donation for its general scholarship fund for the Game of the Year Honor. 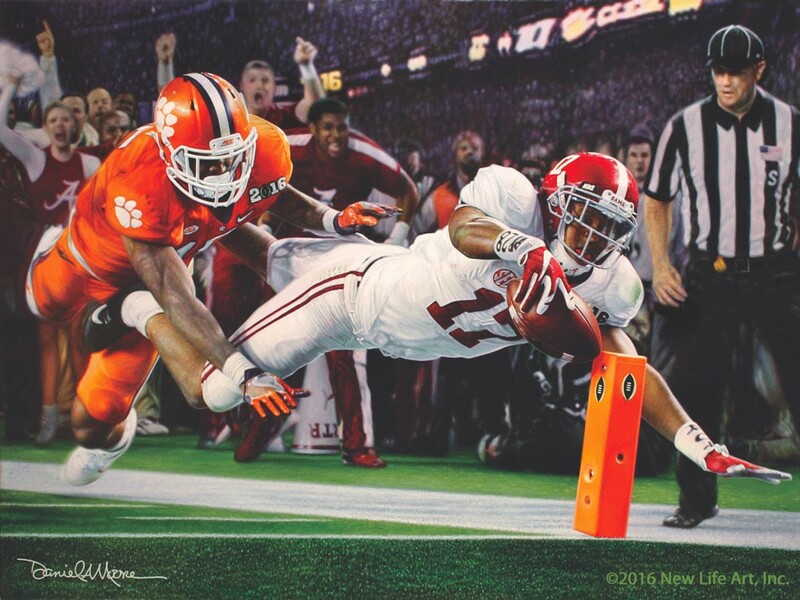 “FINISH!” is the title of Daniel Moore’s original painting commissioned by the United States Sports Academy to commemorate Alabama’s 2015 College Football Playoff National Championship and to reflect the spirit of the Academy’s College Football Game of the Year Award, which went to the Crimson Tide for its win over the undefeated and top-ranked Clemson University Tigers. The painting was recently completed and a print is now on display in the lobby of the American Sport Art Museum and Archives (ASAMA) at the Academy.